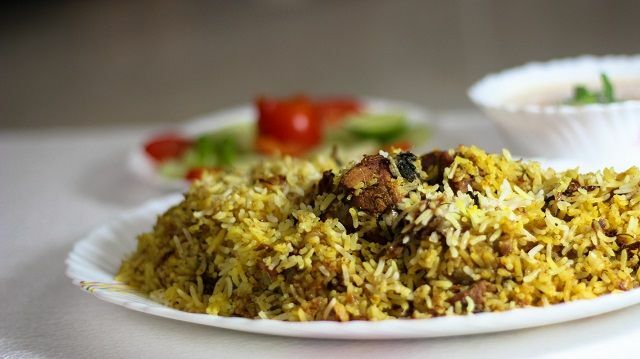 Hyderabadi Mutton Biryani is the king of all biryanies. It is a mixture of original Andhra cuisine and Hyderabadi cuisine, having Mughlai influence. Basically, there are two kinds of Biryani: Pakki Biryani and Kachchi Biryani. 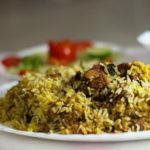 Today I’m going to share how to make Hyderabadi Mutton Biryani or Kachchi Biryani. This is a biryani where raw marinated meat placed on the bottom of the pot and then layer with par boiled rice. Then I will seal and cook it on a low flame for an hour, so that the rice is cooked by steam generated in air tight environment. This entire process is DUM method of cooking. As a result we will get juicy and succulent pieces of meat that melts in your mouth. The rice grain is also well separated and cooked nicely. As soon as onions turn golden drain the onions from oil and keep it in a kitchen towel. We will use it later in our recipes. Wash and clean the mutton drain the excess water. In a blender add shahi jeera,cardamom,cinnamon sticks and cloves blend to a fine powder. 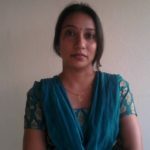 In a large pot or vessel add ginger garlic paste, salt,red chilli powder, turmeric powder, ground masala powder, thick yogurt, and mutton. Mix well. Add the fried onions and half of the oil to the mutton, add coriander leaves and mint leaves Let the mutton marinate for atleast 2-3 hours. Measure rice. Wash and clean the rice by washing twice or thrice. Soak the rice in a wide vessel for atleast 30-45 minutes. In a vessel boil water add shahi jeera, cardamom cinamon,green chillies and salt as the water begins to boil, add the rice. Squeezed lemon to the boiling water. Once the rice is half done strain the rice. Place a colander on top of the empty vessel. Will keep the water for later use. Add the rice to the marinated mutton add the fried onions,chopped coriander leaves and mint leaves. Add saffron milk on top add the oil on top. Cover the lid and place the hot water vessel on top. cook the mutton biryani on medium flame for first 15 minutes then on low flame for another 20-30 minutes.